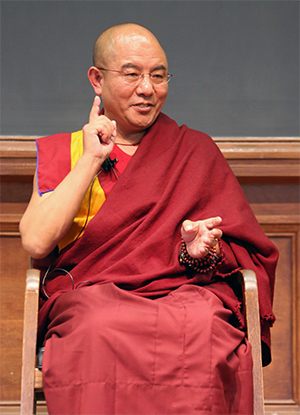 In this talk, Khenpo Sodargye Rinpoche discusses five of the innumerable unique strengths of Tibetan Buddhism to explain its popularity in the modern world today. Milarepa is one of the most famous Tibetan Buddhist practitioners and his legendary life story has inspired generations and countless people to become genuine practitioners. Khenpo advised that with a stronger and calmer mind, there is a possibility for everyone to achieve the same realization as Milarepa in this very life. Hence, debate is very much emphasized in Tibetan Buddhism in order to subject philosophical positions to scrutiny. This is a very rational process. Any points that are unreasonable, are rejected. We would not accept it just because it’s taught by the master or the Buddha. I think Western scholars value this kind of rigorous scrutiny based on logic. If you have the opportunity, you should go observe the rigorous process of debates in Tibetan monastic colleges. In a debate, all debaters take an objective stance and try to overthrow their opponents’ unreasonable arguments with logic, I think this kind of logic is of great importance to us. Though I’m not very familiar with your ways of learning Buddhism, it’s very important for you to not only study but also practice frequently, especially observing your own mind. After studying, you should meditate on what you’ve learned. Do some meditation and remain in a state devoid of any conception. If you practice frequently in this way, you will eventually dispel all your sufferings and negative emotions. In essence, studying Buddhism text through academic approach alone is not enough. You should practice and experience it. Spiritual realizations can be very subtle and can only be actualized and experienced through practice. The Tibetan tradition of Buddhism is excellent in this aspect of practice and realization. How to Solve the Problem of Inner Mind? The wisdom of Tibetan Buddhism can be applied in all aspects of daily life. Nowadays many people are stressed by their very busy life. Science alone cannot solve all the problems of our humankind, and it is useless with respect to our spiritual problems. It’s better for us to rely on some kind of spiritual belief, and the best way to solve the problems of your inner mind is by engaging in actual spiritual practice. We are at the dawn of the age of AI and everyone seems to spend a lot of time engaging in the use of technological devices. Almost no time is spared for learning Buddhism. However, as human beings, we cannot be satisfied by material world alone, the spiritual aspect is also very important and can only be strengthened through spiritual practices like meditation, reciting mantras and so on. If our minds are strengthened through these spiritual practices, we can deal with our lives better. Everything in your life will be much simpler. Many young people are suffering from relationship problems, work stress, and even depression, Buddhism will be of great help to them in dealing with these issues. You may not agree with me. But to realize your inner world is really important for your life. In essence, studying Buddhism text through academic approach alone is not enough. You should practice and experience it. Spiritual realizations can be very subtle and can only be actualize and experience through practice. 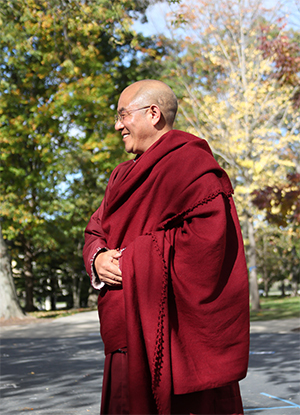 The Tibetan tradition of Buddhism is excellent in this aspect of practice and realization. Nowadays many people are stressed from their very busy life. Science alone cannot solve all problems of our humankind, and it is useless with respect to our spiritual problems. It’s better for us to rely on some kind of spiritual belief, and the best way to solve the problems of your inner mind is by engaging in actual spiritual practice.